Words & Pics by Pete Vickerstaff. 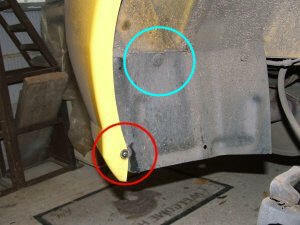 This is a guide on how to fit the OE rear mud flaps to an MG TF. Look out for the to indicate tips along the way. 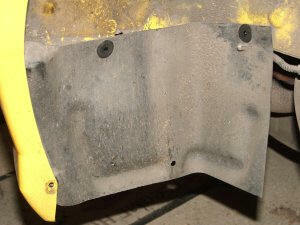 This guide covers fitting of the drivers side rear mud flap. 1. 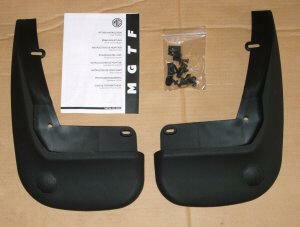 Included in the kit are the ‘instructions’, two mud flaps (obviously! ), and a fitting kit comprising of 4 spring clips, 4 plastic plugs and screws, and 4 self tapping screws. - first tip; the instructions indicate that the two plastic plugs/screws that fix the liner to the wheel arch should be removed. Mine were solid and I had to drill them out. The only reason I see for removing these is to enable a spring clip to be attached to the top outer edge of the liner. 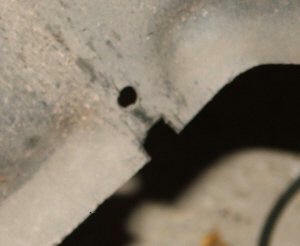 This can be achieved by removing just the centre rear plug (circled in cyan). Four new plastic are included in the fitting kit that can be used to replace the drilled out one. 3. So having removed both plastic plugs, the liner comes away, but is still attached to the exhaust sensor cable, so be careful. 4. A spring clip should now be attached to the upper outer hole of the liner. - To keep the clips in place, squeeze the clip together with a pair of pliers before fitting. 5. This was where the fun began. The next step is to re-fit the liner. It was obvious when I had done this that the upper outer hole was not going to line up with the hole in the mud flap, forcing it deformed the liner and mud flap (circled in red). Looking at the other side I could see that the drivers side liner was either misshapen or was not the right one !!!. Look at the picture and you can see the lip of the arch blinds the upper outer hole. 6. I decided to fit a spring clip and self tapper to the bottom right hole, and a small SS bolt above the upper outer hole. 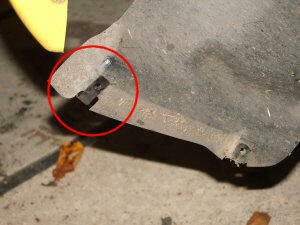 To get the spring clip to fit, I had to cut out a bit of the liner, see the picture. 7. All that needs doing now is to re-fit the liner using the plastic plugs and screws to the top holes. 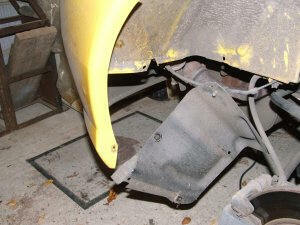 Offer up the mud flap and fit the bottom outer self tapper. - I found it easier to fit by using a longer self tapper than that supplied. Fit a self tapper to the bottom right hole and into the spring clip of the liner (the instructions indicate that a plastic plug and screw should be used here, but I’d used the ones supplied in the two upper holes, I also felt that the self tapper was more secure). 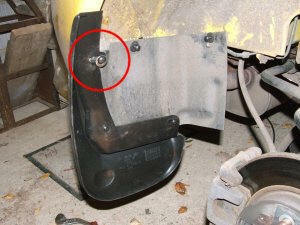 I then drilled thru the mud flap and the lip of the bumper arch, for a small SS nut and bolt (circled in red), although a self tapper and spring clip would probably also work. 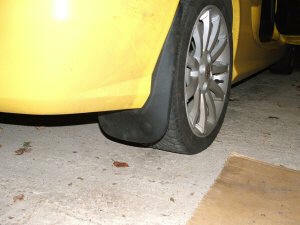 This had the effect of pulling the mud flap onto the bumper to give a better fit. 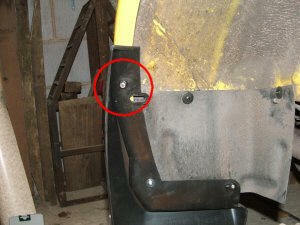 - I drilled a larger hole thru the mud flap to allow for some adjustment. - I applied some black paint to the heads of the self tappers and bolt, hides them quite well. 8. And that’s it, job done (apart from re-fitting the road wheel of course). Sit back and admire your handy work, before embarking on the fitting the other side. Notes.When I fitted the near side mud flap, the liner holes lined up perfectly with those in the mud flap, however, I still fitted a SS nut and bolt as described in step 7 as without it there was a slight gap between the flap and bumper, fitting the bolt pulled the flap up to the bumper, and it gives a more secure mud flap of course.